Country music superstar Luke Bryan recently visited New York City's Lenox Hill Hospital to help Musicians On Call kick off a new and exciting venture! More here. Musicians On Call has kicked off its new Music Pharmacy program, sponsored by Bose and Pandora, with the help of country music superstar Luke Bryan! The innovative program gives patients access the healing power of music at their bedside, including tablets equipped with Pandora Plus subscriptions and top-of-the-line Bose headphones. 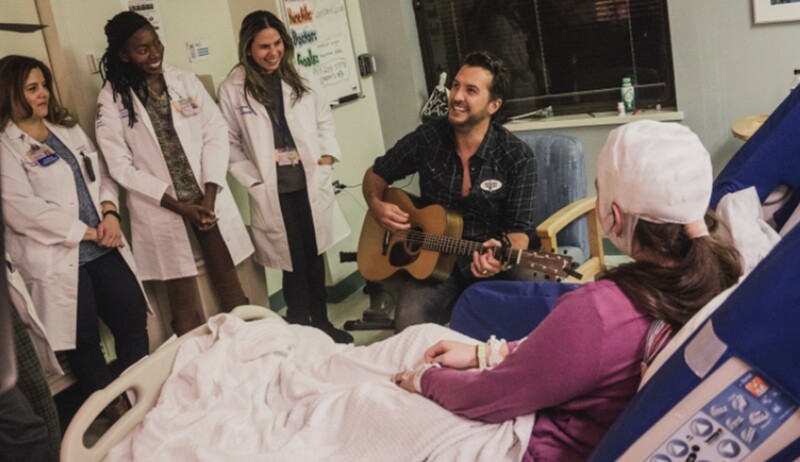 To celebrate the launch, Luke Bryan made a surprise visit to New York City’s Lenox Hill Hospital to perform his hits like “Play It Again” and “Huntin’, Fishin’ And Lovin’ Every Day” for patients right at the bedsides. Following the visit, Luke delivered the Music Pharmacy tablets and headphones to the hospital which will host the equipment for the program. Lenox Hill is the first of 60 hospitals that will receive this new program over the next year. The launch of the Music Pharmacy follows the success of the decade-long CD Pharmacy program, which provided tailored CD libraries and personal CD players to over 800 hospitals across the country. Hospitals can apply to be a Music Pharmacy recipient at http://www.musiciansoncall.org. You can also learn more about the Music Pharmacy program here. Check out Luke’s heartwarming and meaningful visit below! What an awesome way to help people through the healing process! Share this feel-good update with others.